Since the data isn't really available in 1998, it isn't possible to examine the increase in gun sales during the previous biggest drop in crime during 1999. 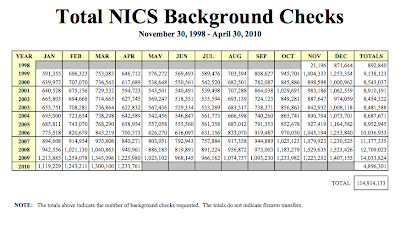 The NICS background check data is available here. In May 2010, 1,016,876 checks occurred. Thanks for the great information. I have a question. I just did an Internet search "number of gun owners in the us". I got 37,599,786 matching results. I could not find one that didn't cite the figure 80 million, or exactly 80,000,000. This is the same figure I was hearing a lot in 1999, prior to the Bush election. 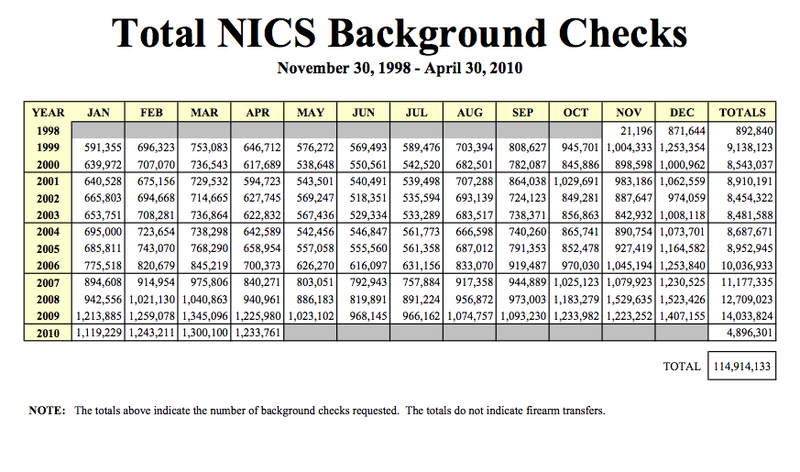 Are we to believe that figure, especially in the light of nearly 115 million NICS checks during that period? Are there no new gun owners in the last 10 years? Not that I want anyone to really be keeping track of such things in a supposedly free society, but it seems like mantra to me. I believe the number is much higher, and the MSM doesn't want to acknowledge it.